MANILA, Jun 22 2012 (IPS) - For the past three months, a transport group in the Philippines has been making use of biodiesel processed from used cooking oil for their jeepneys. 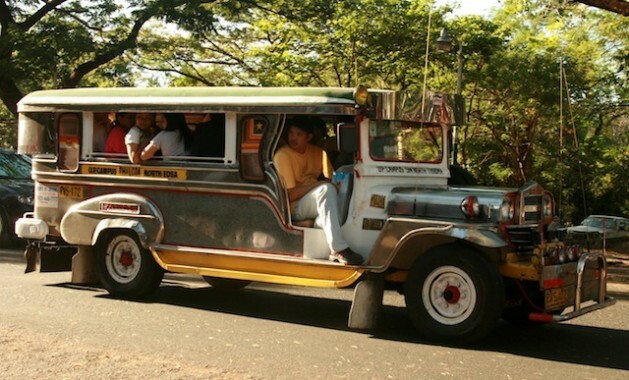 Jeepneys, public transport vehicles originally made from U.S. military jeeps left over from World War II, are one of the most popular means of transport in the country. Pasang Masda, a national association of jeepney drivers and operators, has partnered with EWay 54, a company dealing in the propagation and education of alternative fuels for the benefit of the environment. Eway54 Ecodiesel is made from used cooking oil gathered from hundreds of fast food restaurants throughout Metro Manila. According to Pasang Masda President, Roberto Martin, the biodiesel has proven good for health and the environment as well as their livelihood. “The biodiesel from used cooking oil has been a big help to the drivers. We tried this for three months, and we haven’t encountered any problems with our vehicles yet,” Martin told IPS. “Drivers save as much as two pesos per liter. The drivers who have short routes and consume up to 15-20 liters a day save as much as 40 pesos (0.94 dollars) per day while those plying longer routes can save roughly 80 pesos (1.89 dollars) a day. The extra money they save can help them buy more rice to feed their families,” said Martin. Aside from helping drivers increase their savings due to lower fuel costs, Martin added that the group has documents showing positive developments in the biodiesel cleaning the vehicles’ engines. “Before we started using the biodiesel, many jeeps used to fail smoke emissions test, but with biodiesel, the engines run smoothly and smoke belching is no longer a problem,” said Martin. Studies from the Department of Environment and Natural Resources (DENR) analysing Metro Manila’s air quality reveal that 65 percent of the total air pollution in the capital comes from motor vehicles. Drivers of public utility vehicles like jeepneys can be slapped with penalties and fines for violating Republic Act 8749 or the Clean Air Act. “The fine for smoke belching can range from 23-71 dollars depending on the number of offenses. Our drivers have been able to avoid these heavy fines by using the biodiesel,” added Martin. According to EWay 54’s plant supervisor Glenn Cabrera, this is because biodiesel is much cleaner than regular fuel. “The emissions that come from biodiesel-powered engines are very clean. Biodiesel removes the carbon deposits from the engine and reduces smoke-belching from vehicles, so it’s more environmentally-friendly,” Cabrera told IPS during a visit to EWay’s manufacturing plant. The biodiesel from used cooking oil is also cheaper compared to biodiesel sold in gasoline stations. EWay 54 sells the biodiesel in bulk to Pasang Masda at 38.50 pesos per liter, which is three to four pesos cheaper than the current market value. The transport group redistributes the biodiesel among its members in their different stations around the Metro. EWay 54 claims that the use of alternative fuels like biodiesel can contribute to clean air, is more environmentally and scientifically safe, and is a cheaper and cleaner alternative to fossil fuels. 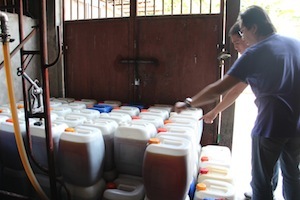 According to Ricky Cuenca, managing director of Eway54, the demand for biodiesel is very high. “Demand has been extremely high because Pasang Masda will take any volume we produce, but we are only producing one to two percent of their total requirement,” Cuenca told IPS. Pasang Masda has over 17,000 jeepneys in its membership, and EWay currently delivers biodiesel to six of the transport group’s 176 stations. Aside from the transport group, EWay 54 is also working with four private companies that are using biodiesel for their transport, logistics and warehouse operations. However, Cuenca says that getting enough supply of raw materials is a major challenge due to the high demand for used cooking oil. EWay 54 sources the bulk of its used cooking oil from fast food restaurants, but they are constantly on the lookout for other possible sources. “It has been very difficult, knowing that used cooking oil is a commodity that is being used as an additive for animal feeds and also in the illegal trade of refiltering used oil to be resold in the markets,” said Cuenca. A new bill prohibits the practice of using recycled cooking oil, except for industrial purposes, due to potential health hazards. “We started out making 50 gallons a day but now, we are up to 3,000 -4,000 gallons a week,” said Cuenca. Collection of used cooking oil also remains a logistical challenge. Every day, the company collects as many as 150-200 tins of used cooking oil from their suppliers. The manufacturing plant has the ability to process a minimum of 1,000 liters a day, depending on the availability of the raw materials. The process includes pre-filtration to remove the food particles and other solid materials from the oil. Then the conversion process, which can take five hours, transforms the used cooking oil to biodiesel by removing the glycerin. The oil undergoes three stages of washing to remove excess glycerin, then the oil is heated to a certain temperature so the excess water evaporates. The oil is cooled down and re-filtered before the final product is ready to be sold to clients. According to Henry Palacios, EWay’s director for Business Development, there is a movement towards using renewable energy in the country because of the environmental benefits. Aside from giving off cleaner emissions, biodiesel is nontoxic and comes from renewable biological materials such as vegetable oils or animal fats, making it more sustainable than fossil resources used to make diesel fuel. EWay is currently exploring other possible clients. “Other companies that could benefit from biodiesel include private companies that need fuel for forklifts or transport trucks, condominiums or establishments that use generators, and even boats and shipping companies,” Palacios told IPS. According to Cuenca, at 20 percent blend, the biodiesel can lower CO2 and sulfur emissions by 15 and 30 percent respectively. Pollutants can be further lessened the higher the percentage blend of the biodiesel. Cuenca stressed that having clients in the public transport groups that consumes four billion litres of diesel every year in the Philippines has made a large impact. Cuenca added that they need to step up their efforts to educate restaurants, oil suppliers, new users and the public in general. According to Cuenca, any vehicle with a diesel engine can immediately use the biodiesel without having to convert anything in their engines. “Many people ask us if there are any modifications or changes they need to do with their engines, we say no. The only thing we need to change is our mindset and perceptions of renewable fuel,” said Cuenca.